The exact Jupiter-Saturn square coincides with a U.S. Presidential Election year every 20 years, and we can make certain observations about what this configuration means for Election 2016 and for previous U.S. Presidential Elections. For most of 2016, Jupiter and Saturn are transiting in a mutual square relationship, in this case the last quarter square prior to the JU-SA conjunction in Dec. 2020. In 2016 there are two exact squares, March 23 and May 26, 2016. This theme was first introduced in my article “Trump it Up” (Dec. 21, 2015): https://edithhathaway.com/trump-it-up/#more-625. 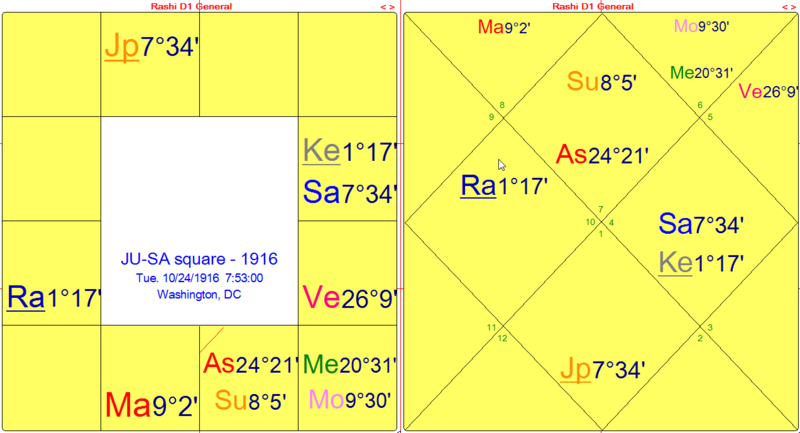 To recap, I have said that when a JU-SA square occurs in a U.S. Presidential election year, it tends to indicate a political upset, but this is further qualified by whether fixed signs (sidereal zodiac) are emphasized, giving continuity, and whether Rahu and Ketu are involved in the square, giving the upstart, insurgent energy. With the JU-SA square chart May 26, 2016, it looks like the Democrats could keep the White House in 2016, but that an insurgent candidate is more likely to ascend, one who comes from behind. The continuity from the previous party is shown by the large number of planets in fixed signs (7 planets), including Jupiter and Saturn. The insurgent candidate is shown by Rahu conjoining Jupiter in Leo. Later we will explore whether this could possibly imply the conjoining of an insurgent candidate with an establishment candidate. We will also study Pluto’s close opposition to the USA Sun. Prior to 2016, the most recent example cited of the JU-SA square was in Nov. 1995 (in fixed signs Scorpio and Aquarius), indicating the re-election of incumbent President Bill Clinton. Ideally the JU-SA square should occur during the Election year, but at least it was within one year of the election, though not in calendar year 1996. And while the chart indicated his re-election, it also showed how he was mired in scandals and considerably weakened by them. But the public was so fed up with the scandal-ridden Nixon presidency, the Watergate scandal and Ford’s pardon of Nixon that a Washington outsider and perceived reformist could do well in such a political environment. Jimmy Carter ran successfully against President Gerald Ford (U.S. President 1974-1977), an unelected incumbent who succeeded President Richard Nixon when he was forced to resign Aug. 8 1974, the first U.S. President ever to resign in office. Even Nixon’s elected Vice President Spiro Agnew was previously forced to resign in Oct. 1973 due to charges of extortion, tax fraud, bribery and conspiracy. Nixon then appointed House Minority Leader Gerald Ford, who had had served for 25 years as a Congressman from Michigan. Ford was thus the first presidential incumbent never to have been elected either as Vice President or President, and this left him in a relatively weak position within his party. He was not sure of the nomination prior to the Republican National Convention and was seriously challenged by party rival Ronald Reagan, future U.S. President, 1981-1989. In the JU-SA square chart for Tuesday, March 9, 1976, the 10th lord (Venus) from Leo Ascendant represents Ford, the sitting president. Though in an angular house in a friend’s sign (Aquarius), Venus is relatively weak at zero degrees of the sign. Venus is in the 7th house in Dhanishta, a Mars-ruled nakshatra. The 10th house from the 10th lord is Mars-ruled Scorpio, and represents the next president. Mars in Gemini is situated with the Moon in Mrigashira nakshatra, a fruitful and nourishing nakshatra, in the 11th house from Leo Ascendant. This gives much more power to Mars, which is also Day lord of Tuesday. Furthermore Mars becomes angular in the Navamsha chart and is strong in its own nakshatra in the Rashi chart. As such it also has some power over Venus, the sitting president. Though the Ascendant and three planets are in fixed signs, Jupiter and Saturn are not in fixed signs (i.e., specifically in a JU-SA square). This is generally unfavorable for an incumbent candidate (or party) seeking to retain the White House. Prior to this, in 1956, tr. Jupiter and Saturn were in a fixed square (Jupiter in Leo, Saturn in Scorpio) for nearly nine months during Election year 1956, up to Oct. 29, 1956, with the election eight days later on Nov. 6, 1956. Tr. Saturn was on the Rahu-Ketu axis and the only issue against the popular incumbent President Eisenhower was his health, as he had suffered a serious heart attack in Sept. 1955. But this and other health issues related to his Crohn’s disease were kept fairly quiet, and he beat his 1952 opponent Democrat Adlai Stevenson in another landslide victory. This time he won by an even wider margin, 57.4% to Stevenson’s 42.0%. Likewise, with Jupiter and Saturn in a fixed square for most of 1936 (Jupiter in Scorpio, Saturn in Aquarius), President Franklin Roosevelt easily won re-election by 60.8% over Alf Landon at 36.5%. Tr. Jupiter in Sagittarius can also be superimposed on to the USA Ascendant, where it conjoins the Ascendant it rules, though it is opposite natal Sun in Gemini. (The USA chart is coming up shortly.) Jupiter’s transit in 1948 would benefit the incumbent and the status quo, though outer planet Uranus (the revolt, or rebel) was transiting in Gemini opposite the USA Ascendant. But on Oct. 10, 1948 Uranus turned Stationary Retrograde at 7:26 Gemini, away from the USA Ascendant degree at 8:49 Sagittarius. This had the effect of the opposition forces to the sitting presidency losing momentum in the month prior to Election Day, Nov. 2, 1948. In 1904, when Republican President Teddy Roosevelt sought his first elected term (having come to office after McKinley’s assassination Sept. 6, 1901), he had little opposition before the national convention in June 1904. His one major competitor, Ohio Senator and businessman Mark Hanna, died in Feb. 1904. During most of 1904, including on Election Day, tr. Jupiter and Saturn were in a sextile (Jupiter in Pisces, Saturn in Capricorn). This combination favors keeping the status quo. In 1916, incumbent Democratic President Woodrow Wilson won by a narrow margin, 49.2% over Republican Charles E. Hughes at 46.1%. Tr. 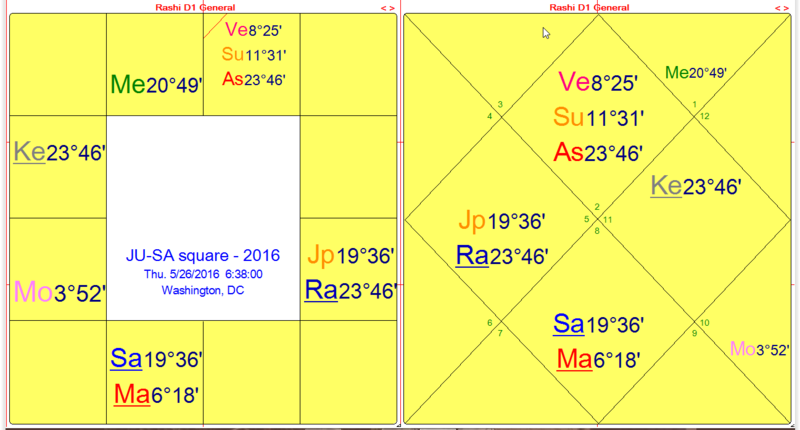 Jupiter and Saturn were in a chara (cardinal) square (Jupiter in Aries, Saturn in Cancer on the Rahu-Ketu axis). In this chart there are some interesting factors: 10th lord Moon is situated in Virgo in the 12th house from Libra Ascendant, considered a weak position from the Ascendant. Wilson was most known in 1916 as the president who “kept us out of war” (i.e. World War I, then called “the Great War”). The 10th house from 10th lord (Moon in Virgo) is Gemini, ruled by Mercury. Mercury is conjoined with Moon in the 12th house in Virgo. This showed that not much separated the two candidates in terms of their actual policies, even if Wilson was known as the “anti-war,” “non-interventionist” candidate to Hughes’ “moderate interventionist” stance. The 12th house pertains to events in foreign countries. With the Mexican Revolution to the south, and World War I to the east, America was still officially neutral, as were the majority of its citizens. Ironically, within a month of his inauguration March 4, 1917 (the U.S. Presidential Inauguration date up to 1933), Wilson would shift his entire focus to persuading the American public that the U.S. should fight in World War I, defending Britain and France against Germany and its allies. The U.S. officially entered WWI on April 7, 1917 and Wilson dedicated most of his second term to the war effort and following that, the 1919 Paris Peace Conferences and his support of the Treaty of Versailles. When the treaty was rejected by the U.S. Congress in March 1920, Wilson was left disappointed and embittered about his specific proposals for world peace, including his idea for a League of Nations, the 14th of his famous 14 Points. In 1992 Democrat Bill Clinton defeated incumbent Republican George H.W. Bush. From mid-September 1992 onward Jupiter and Saturn were transiting in an earth trine (Jupiter in Virgo, Saturn in Capricorn). This should have helped the incumbent, but there were other factors at play that favored a candidate from the opposition party, including tr. Uranus and Neptune closely opposite the USA natal Sun at 22:38 Gemini. Another major factor was the 28-year U.S. Presidential Election cycle, which for the Republicans marked 1992 as a vulnerable juncture, as this was the 12-year mark (and a complete Jupiter orbit) from its start in 1980. Similarly, Truman was not vulnerable in 1948, as the Democratic Party’s 28-year Presidential Election cycle was still in its early stages, from 1940. (This original research appears in my book In Search of Destiny, 2012, pp. 40-41.) Now in 2016 tr. Pluto plays a similar role that tr. Uranus and Neptune played in 1992, as Pluto in Sagittarius transits closely opposite the USA Sun, with tr. Uranus in Pisces closely squaring tr. Pluto and natal USA Sun. PLUTO TRANSIT OPPOSITE USA SUN: WHAT DOES IT PORTEND? For most of 2016, transiting Pluto is within 1 to 2 degrees opposite the USA natal Sun at 22:38 sidereal Gemini. (While classical Vedic astrology does not incorporate Uranus, Neptune and/or Pluto, I do consider them if they are transiting within 1 or 2 degrees of an important planetary or chart reference point.) The Sun symbolizes leadership and Pluto is associated closely with radical transformations that tend to occur through elimination and renewal, as if a total breakdown must happen before a building process can occur. It has brought with it at least two presidential candidates who strongly challenge some basic tenets of their political parties as well as the party leadership: Donald Trump and Bernie Sanders. They even agree on certain topics. Surprisingly for a GOP candidate, Trump has attacked the TPP (Trans Pacific Partnership), lending policies of big banks, as well as tax avoidance by big corporations on profits they make overseas. But from there, differences abound, as Trump espouses many Right-wing sentiments that horrify many of his opponents on the Left. 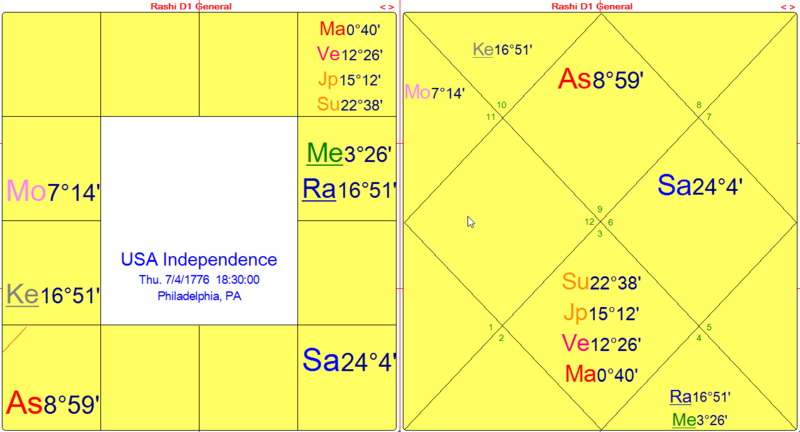 United States Independence: Rectified by Vedic astrologer James Kelleher: July 4, 1776, 6:30 pm LMT, Philadelphia, PA, USA. An opposition aspect is a challenge, and with tr. Pluto so closely opposite the USA Sun during most of 2016, this is a direct challenge to the current leadership. It also holds true that the oligarchy is trying to maintain and strengthen its grip on the government and its policies. Big Money and Big Media have tried (and almost succeeded) in ignoring and minimizing the record and campaign of the major anti-establishment candidate, Bernie Sanders. He is challenging many establishment rules, including by fundraising from individuals at a historic pace and without Super PACS. Trump is a billionaire, real estate mogul and media star who though challenging the party elite is also part of the establishment elite. As a political candidate he is unprecedented in his mastery of how to dominate the media and the news cycle. Trump has said that his supporters will riot at the national convention in July if he is not given the nomination. Sanders too is dedicated to winning the nomination, but Clinton has been the front-runner since they both declared their candidacies in April 2015, and she had 98% of the name recognition, endorsements and financial support at the start. Currently Clinton still has the bulk of the Superdelegates, whose votes are not fixed until the convention in any case. But the gap between Clinton and Sanders in pledged delegates has gradually narrowed; and as of late March 2016 Sanders wants Superdelegates to reconsider their votes, especially in states where he has won, in some cases by huge margins. As of late March 2016 Clinton has won 18 states and Sanders has won 14 states. But of those 18 states won by Clinton, two of them were near ties: Iowa and Missouri. Polls also show Sanders winning against Trump by wider margins than Clinton against Trump. Meanwhile, lack of campaign finance reform keeps bolstering the status quo, and Sanders has made this issue central to his campaign. He vows to appoint a judge to the Supreme Court who is committed to revoking Citizens United, a Supreme Court decision passed Jan. 21 2010 that clears the way for the oligarchy to buy elections. Small wonder Sanders is not the darling of Big Media, whom he regards as “an arm of the ruling class of this country.” He often speaks of “a rigged system” and “a rigged economy.” In Europe they have laws restricting the “Abuse of dominance” by corporations. But in the U.S. such laws have been steadily stripped away since the mid-20th century. Bernie Sanders vows to address these issues, starting with his own personal example of not accepting campaign financing from corporate donors. In declaring his candidacy, he knew he was facing major obstacles, including the formidable Clinton machine. There are many examples over the past year of how the establishment manages upstarts who question their authority. Here is one: http://www.rollingstone.com/politics/news/how-the-new-york-times-sandbagged-bernie-sanders-20160315. The author discusses an article in The New York Times, the establishment press that has endorsed Clinton and does a lot of propagandizing for her. This March 13, 2016 article is titled “Bernie Sanders Scored Victories for Years Via Legislative Side Doors.” It is a left-handed compliment to Sanders’ many years of successful work to pass legislation, working with both Republicans and Democrats. But for their print and on-line edition, the article was quickly re-titled “Via Legislative Side Doors, Bernie Sanders Won Modest Victories.” They removed any previous praise about his “very successful strategy” and added doubts about Sanders, not surprising for a paper which effectively speaks for Clinton. Perhaps it is no coincidence that millennials (ages 18 to 33) do not watch cable news but get most of their news on the Internet. These same young voters (ages 18-30), both Democrats and Independents, have been voting for Bernie Sanders by margins of ca. 80% or more. He is also favored by voters ages 31 to 45. This may be why Internet polls rating the Democratic debates overwhelmingly favored Sanders by 80% or more, and why these polls appeared on Big Media only fleetingly, if at all. The media is an arm of the ruling class of this country and they want to talk about everything in the world except the most important issues.… Because if you talk about real issues and people get educated on the real issues, you know what happens next. They might actually want to bring about change. Bernie Sanders, live interview, Cenk Uygur’s The Young Turks Internet news show, March 23, 2016. Pluto has some of the same qualities of Rahu, i.e. unruliness, outsider status, and rocking the establishment boat, demanding changes to the conventional way of doing business. In this 2016 Election we see from Primary statistics that in some states many people are voting outside their parties. So too in the General Election we see the possibility of partisan realignment and voters voting against their party’s candidate or voting to block a primary candidate. This is already happening in the primaries regarding Donald Trump and it causes havoc for the pollsters and pundits. The Republican Party is split between party insiders and Trump supporters, but even party insiders have many factions and many views about what should be done to stop Trump; and astrologically speaking, no Republican alternative is likely to stop him, in my opinion. Trump tends to draw voters who have both economic anxiety and racial resentment, and this feeds some of his more extreme statements and policies that terrify his detractors. They accuse him of breeding hatred and violence, including at his own rallies. This disturbing trend has increased since late fall 2015, coinciding with his Rahu-Mars Dasha, and bringing with it more and more protestors to his events and even to some of the Trump landmarks around the country. All these anti-establishment themes cannot be assigned solely to the transit of Pluto opposite the USA Sun. They are also confirmed in the Jupiter-Saturn squares March 23 and May 26, 2016, which involve Mars with Saturn in Scorpio for six months (Feb. 20 to June 17; July 12 to Sept. 17) as well as Jupiter and Rahu in Leo for 7 ½ months (Jan. 8 to Aug. 12, 2016). Though completed by mid-August 2016 the Jupiter-Rahu combination colors all of 2016, appearing in various charts with an imprint for most of 2016, including the Vedic New Year chart April 7, 2016. It has upset the usual order of politics, especially with Big Media, which though it has dominance over cable television, cannot quash every outlet of the multi-level platforms available via independent and social media. Democracy is still vibrant in these realms, at least in the West, and in spite of mass surveillance. (Note the influence of Rahu (the outsider, the heretic) on Jupiter (the media, among other things, also royalty, including political royalty.) We see this especially with Jupiter and Rahu in the royal sign of Leo. Leo is the most royal of the fire signs, and contains Magha nakshatra, where the throne resides. As mentioned at the outset, I have said since Dec. 2015 that the May 26, 2016 JU-SA square chart indicates that the Democrats could keep the White House in 2016, but that an insurgent candidate looks more likely to ascend, one who comes from behind. I also said that I considered the two frontrunners, Trump and Clinton both face potential big downturns in 2016, Trump more so after mid-August 2016. The first JU-SA square on March 23, 2016 at 22:19 Scorpio-Leo is further emphasized by the Total Solar eclipse March 8, 2016 at 24:50 Aquarius and Saturn Stationary Retrograde at 22:20 Scorpio on March 25, 2016. The candidate with the closest connection to these degree areas is Bernie Sanders, whose natal Sun is at 22:06 Leo and MC (Midheaven) at 25:12 Aquarius. I have said he should have some major wins reflected in the March 8th Total Solar eclipse. He did have a big win on March 8th – “A Shock Victory” in Michigan and “Among the Greatest Polling Errors in Primary History” (Nate Silver, pollster), plus a win from Democrats Abroad. They voted March 1-8 in over 170 countries, with Sanders winning 69% over Clinton’s 31%. He then also had three major wins on March 25. Prior to that Clinton had other wins, including five states on March 15, one of them (Missouri) very narrowly. In an environment favoring the anti-establishment candidate, this Pluto transit gives another vantage point to our topic, since – if Hillary Clinton were to be the Democratic nominee, she is severely challenged by the one remaining anti-establishment candidate: Republican front-runner Donald Trump. However, this is the complication: Trump’s birth chart indicates he has a very bumpy road from now through November, and especially from mid-August 2016 onward. I have said in Dec. 2015 that Trump IS the likely Republican nominee, since his chart is stronger than any of his GOP rivals. (see link to “Trump it Up” above and in Selected References) But the most turbulent period of his current planetary period, his Rahu Dasha, runs from Oct. 29, 2015 to Nov. 16, 2016, marking the end of that 18-year Dasha. This is classically a period of loss, and in this case is combined with a very fated chart. Trump’s natal Full Moon is at 28:05 Scorpio (a treacherous degree area), within 1/2 degree of a Total Lunar eclipse at 29:38 Scorpio. This is across the axis of Houses 4 and 10, with Sun in the 10th house of career and status, Digbala, best angular house position for the Sun in a Leo Ascendant chart. Mars is in Leo in the Ascendant and becomes more important in this Rahu-Mars period, especially since Rahu is in Mrigashira nakshatra in the 10th house and is ruled by Mars. Mars is in Magha nakshatra ruled by Ketu. Thus the eclipse axis (Rahu-Ketu) is invoked many times over. For a person with a dramatic life, this period could be marked with many very dramatic life events, and within a period that tends to bring major losses or setbacks. Both front-runners are vulnerable, Trump more so after August 12, 2016, when – as I expect – he will already be the Republican nominee. But though he has remained GOP front-runner, Trump has attracted more and more controversy the deeper he gets into his Rahu-Mars period, Oct. 29, 2015 to Nov. 16, 2016. His challengers at this point look to be Ted Cruz, who is well behind him in delegates, and/or Mitt Romney. The rumor is that Romney may be urged to run again (with Paul Ryan, Speaker of the House) as a counter to Trump. This would require a “brokered convention” and would mean contesting Trump’s already substantial state victories in the primaries and caucuses. Among all five remaining candidates as of late March 2016, Clinton is the most closely tied with the political establishment. And despite her stronger progressive stance the longer she campaigns, reversing many of her previously held policy positions, her close ties to Wall Street and the oligarchy indicate that the 1% is counting on her to protect their status quo. Clinton has made some serious gaffes, including in March 2016 when she praised Nancy Reagan for “leading the national conversation on AIDS.” In fact Nancy and President Reagan both ignored the issue for most of his presidency, even turning their backs on their friend Rock Hudson when he sought their help in 1984. Clinton soon apologized for the statement. Even so, none of her missteps so far have been serious enough to change her front-runner status. Her main obstacle to the nomination currently is that Bernie Sanders keeps winning votes, whereas she had assumed she could wrap up the nomination by mid-March 2016, if not earlier. Two days after she won five states on March 15, President Obama’s remarks at a private fundraiser became widely known when he suggested that Democratic funds should now all be directed towards Clinton, and all focus directed to supporting her candidacy. What he does not apparently understand here is the extent of anti-establishment fervor fuelling the Bernie Sanders candidacy as well as the Donald Trump candidacy. This is also supported by the planetary configurations of 2016. The primary race is not finished yet, though April 2016 could prove decisive, given the confluence of astrological and campaign markers (see list below). Transiting Mars entered Scorpio on Feb. 20, 2016, but as of late March 2016 this factor has not yet made a big dent in Clinton’s vote returns in the primary and caucus races. Her biggest gains this month were on March 15 (five states) and on March 22 in Arizona. But Clinton may yet face some obstacles on her path once transiting Mars turns Stationary Retrograde in Scorpio April 17. This could have an adverse effect on her that Mars at zero bindus has not shown very much so far. Mars is retrograde Apr. 17 thru June 29, 2016. It remains in Scorpio thru June 17, returning again to Scorpio July 12 to Sept. 17, 2016. The Democratic National Convention is July 25-28, 2016, coinciding with tr. Mars in Scorpio with Saturn. If it fails to make any further impact on her, then we might conclude that this Mars at zero bindus is significantly modified by being conjoined with tr. Saturn in Scorpio, and that this resonates with her natal Mars-Saturn combination in Cancer in her 10th house. The California Primary is scheduled for June 7, 2016, with 546 pledged delegates at stake for Democrats and 172 for Republicans. It is by far the biggest haul of delegates and hugely important to all candidates in seeking the nomination of their respective parties. Given all the astrological factors favoring the anti-establishment themes, how does an establishment candidate such as Clinton win the White House? Does it possibly satisfy the planetary criteria to have an anti-establishment Vice President with an establishment President? Or vice versa? How could this work? We can only speculate on the radical number of concessions that would have to be made. But this is another possible meaning of Jupiter-Rahu in Leo, as I have said the Democrats are likely to retain the White House, but that an insurgent candidate is likely to ascend. According to current Gallup Polls, 42% of registered voters identify as Independents, many of whom have been voting for Sanders by large margins in the primary races and caucuses where Independents are allowed to vote, though Trump too has attracted voters across party lines, including Independents. But since Sanders has so consistently won with Independents, if he faced Trump in November, we could witness a large gravitation of Independent voters to Sanders. Venus is the planet of politics, and its movement through the heavens is critical to political events. Prior to the California Primary, from March 31 to April 24, 2016, Venus transits through Pisces, its sign of exaltation. This favors Sanders. In my rectified chart it is in his 10th house conjoined his natal Moon in Pisces, opposite natal Mercury and Venus in Virgo. 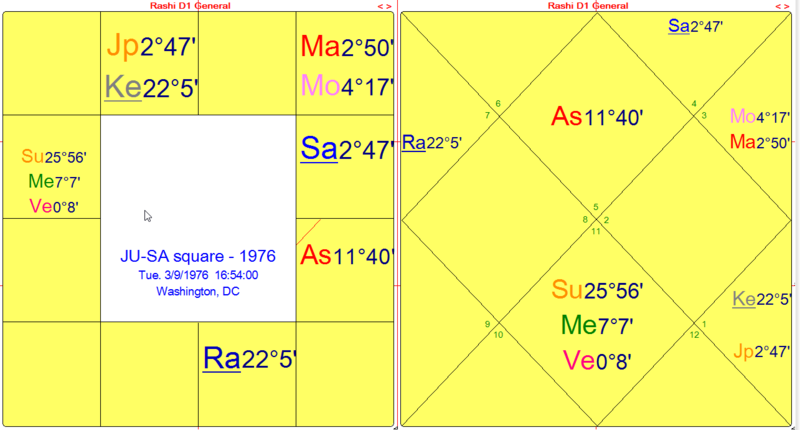 He is currently in Rahu-Venus Dasha, using my rectified chart (Sept. 8, 1941, 1:05 am EDT, Brooklyn, King’s county, NY). For Clinton, it would be in her 6th house, and not advantageous, especially as her Ascendant lord is Venus. Likewise, for Trump, it is in his 8th house and not advantageous as his 10th lord in the 8th. However, during the July national conventions Venus transits through Cancer, which is reasonably favorable for all three candidates. Of course the New York State Primary on April 19 is hugely important, with 291 pledged delegates for the Democratic Party candidate and 95 to the GOP candidate. This is closely preceded by both Mars Stationary Retrograde and Pluto Stationary Retrograde (see list below). The Stations of planets have an enormous impact, as when they make a station, they appear to be standing still from the viewpoint of the earth. Their motion slows for several weeks on either side of the Station, and during retrograde motion they are closer to the earth, magnifying their effects – which are shown by the inherent nature of the planet. In the case of Mars, it can range from auspicious action to acts of war and violence, especially in combination with Saturn and in Saturn’s nakshatra Anuradha (3:40 to 16:30 Scorpio). For Pluto, we look for profound transformations that are not easy to experience or absorb, but mark major turning points. Pluto in Sagittarius opposite the USA Sun is pushing our leaders and leadership to change the way they think and to change some fundamental part of their philosophy, including about world religions and foreign powers, also potentially global trade and travel. Tr. Pluto is also in a close square with tr. Uranus, a combination which tends to bring sudden and rapid changes of a radical, revolutionary sort. Aside from the obvious drama we have already seen, especially on the Republican side, we should expect to see Election 2016 shaping up as one of the more pivotal and memorable Presidential Election years. This in turn will set the stage for the momentous JU-SA conjunction in Capricorn occurring Dec. 21, 2020 at the Winter Solstice, and closely following the 2020 U.S. Presidential Election. If the patterns continue as they have since 1940, the Democrats are due to hold the White House for 28 years, with a break at the 12-year mark. Even if a Democrat is elected President in Nov. 2016, this cycle starts from 2020 and must coincide with the JU-SA conjunction within at most several months of either the Presidential Election in early Nov. 2020 or the Presidential Inauguration Jan. 20, 2021 – preferably both. Both dates are very close, as is the Winter Solstice, increasing the power, perceived or otherwise of the Presidency to come in 2020. Tr. Pluto opposite natal USA Sun (1 degree orb) : Jan. 20 to July 28, 2016; Nov. 23, 2016 to Jan. 24, 2017.